Linden Street, Allentown. 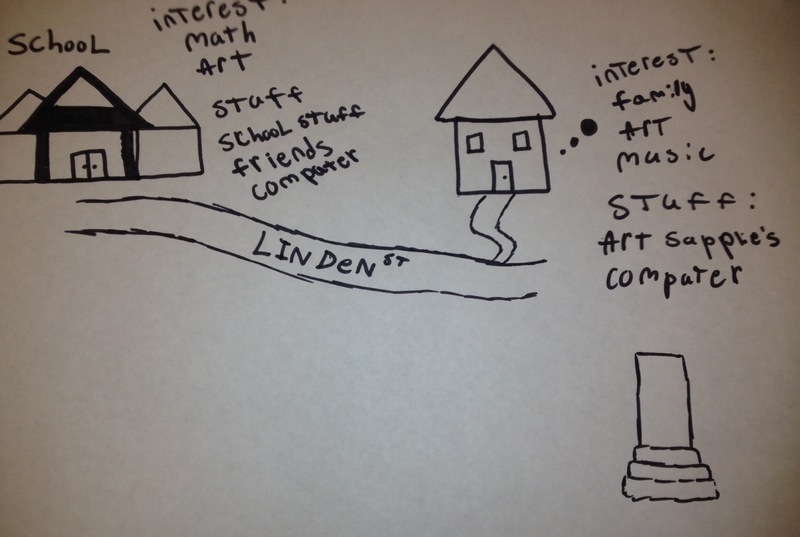 The road between home and school. HYPE youth media program, 2016. I am reading a “talking book”–it is a dialogue between Paulo Freire and Myles Horton on their “formative years,” narrating their subjectivities and identities as educators, theorists, and social justice activists. Each tells a story that invokes the importance of being located in place and time. Beneath a mango tree in Recife. Beside a river in western Tennessee. I read it and hope for a deeper understanding of the cultural historical settings shaping their identities and perspectives on education and social justice. I also read it as a provocation to consider my own subjectivity and identity as an educator. How do I locate myself in this conversation about theory, practical experience, education and social justice? How do I locate myself in relation to this “talking book”–in relation to others who are trying to connect their work in higher education with a better future? As our tweets under the hashtag #HortonFreire are interrupted by tweets reminding me this is a time of growing fascism and oppression, I get to thinking that the work of making the road is always incomplete. It is making and remaking. And sometimes it feels like the ground on which you might even begin to build a road has been ripped out from under you. Wanderer, we have no road. In 1999, I moved to Sao Paulo, Brazil, to help design and establish a technology program in a private bilingual elementary school. I was eager to learn the school culture, collaborate with the teachers and have their voices guide the project. I did not want to be another “technology missionary” imposing ideas on teachers who were the experts of their curriculum and school culture. The work I was beginning was an outgrowth of my studies with Michael Cole at UC San Diego and UCLinks, and the proposal was to adapt the “Fifth Dimension” model to reflect school and community interests, especially those related to local culture, language, and educational concerns. I suggested this approach to the school’s director, as an alternative to outsourcing “informatica” to a British company that was aggressively marketing its curriculum to private schools in Brazil. I argued that any tech project that excluded teachers from its planning and instruction would breed distrust, skepticism, undermine the integrity of the curriculum, and never be wholly embraced within the school culture. It was easy for me to stand up and make a strong case against outsourcing the school’s tech curriculum to a global for-profit edtech company. I’d been engaged in supporting and participating in community-driven technology-based learning projects and environments throughout undergraduate and graduate school. What I was unable to see at the time, however, was how my own location as an outsider, speaking English as a first language, situated in structures of whiteness and class privilege, positioned me in equally problematic ways within the school. While I was busy with a frenzy of questions about how to pack up a life and move from Berkeley to Brazil on short notice, what kinds of questions where teachers asking about me and my sudden appearance at the school? About the creation of a new administrative position, “Coordenadora de informática”? About importing an educator from the US for that position? What kinds of questions, about equity and privilege, about language, culture, and power, came to mind for teachers when they learned the school would provide for the holder of this new position housing and a car, as well a salary paid in US dollars? I was so uninformed. It turned out that, early on, teachers were more interested to talk with me about Vygotsky because they knew that I as was a student of Mike Cole, who in turn studied with Vygotsky’s student/colleague Alexander Luria. They carried their own copies of texts by Vygotsky and Cole, in Portuguese. Many of my new colleagues studied with leading Brazilian scholars on Vygotsky and sociocultural theory at the University of Sao Paulo down the road. In my eagerness to chat about Freire, I was missing opportunities to talk about the theoretical and practical issues that they were working with at the time. It’s not that they didn’t care about or engage with Freire’s work–they did, and they had a lot to say about the influence of Vygotsky on his work–but that I was ignorant to act as if their basis in critical pedagogy began and ended with his work. During my three years at the school, my colleagues taught me about the work of many critical pedagogues and theorists that I had not encountered in my studies. I also imagined a shared interest in Freire provided a ready-made bridge across our differences. Bridges, like roads need to be made. Shared theoretical perspectives and grounding mattered to the work we would do together in the years ahead. But my identity and positioning as the “technology expert from the University of California” located me within an ongoing struggle within the bilingual culture and curriculum of the school. This was not self-styled–I recall very well the evening that I was introduced to parents at the school and felt bewildered by how much those credentials combined with my status as “native English speaker” to confer authority and value in the competitive marketplace for bilingual education in Sao Paulo in the late 90s. This was some of my early awakening around the nexus of language, culture, and power that teachers were navigating and that I would also learn to confront. They worked tirelessly to ensure that the project-based Brazilian curriculum enacted in Portuguese during the morning informed and was pedagogically aligned with the English language curriculum taught in the afternoon. This was critical, difficult work because the English language texts from US academic publishers inscribed within the curriculum a hegemonic worldview and dominant discourses that the Brazilian national curriculum explicitly confronted and challenged. The politics of language and power played out in other ways. Although I was quickly developing speaking proficiency in Portuguese, I was encouraged and expected to speak only in English (especially with the children who turned out to be my very best language teachers). Who was I, showing up in a private school in Sao Paulo with a dozen blue Apple iMacs, and with what kinds of intentions towards constructing new “progressive” learning arrangements around this technology? What ideological interests did that technology express and represent? If pedagogy is understood as a struggle over cultural meanings, what about my own location in an exploitative capitalist global division of labor? These are questions that loom for me now in rereading Horton and Freire, and making some sense of the meanings that emerge as I join fellow wanderers through this text. As a graduate student reading Horton and Freire, on my sunny Southern California campus, I wanted to find in that text resources for hope, for strategies and methods aimed at making a difference in the afterschool educational settings where I was doing research. I read Freire at an epistemological distance that privilege affords–in a way that left intact my taken-for-granted assumptions about how and where learning takes place. It was the mid-1990s, and the UC Regents sent shockwaves through the state when they voted to eliminate affirmative action in university admissions. Based on his work with an afterschool project called the Fifth Dimension in San Diego, Cole and colleague Charles Underwood at the UC Office of the President, had the idea that universities and communities across the state might partner to create technology-based afterschool programs as an alternative way to build pathways (make roads) to higher education for underrepresented minority youth. All of us involved, undergraduates, graduate students, faculty, staff, wanted to make a difference. Looking back on this work, now in relation to my current teaching in the privileged environment of a private residential liberal arts college, I recognize more fully the ways that in designing the Fifth Dimension, Cole was also aiming to disrupt the alienated college education of students like myself in communication, education, psychology, and other social science disciplines. 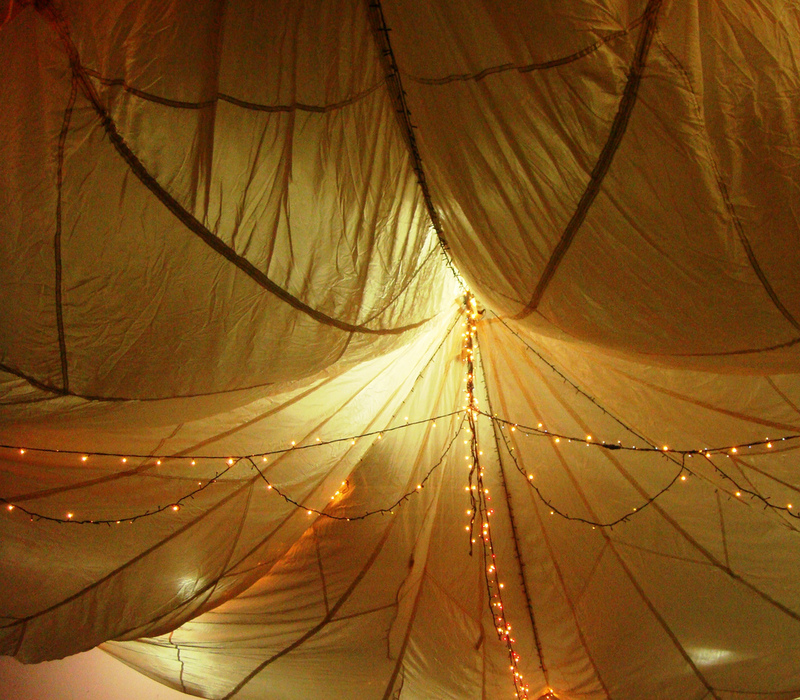 This was a first invitation to experience education as border crossing, and our weekly fieldnotes meant to create space for our critical engagement with the politics and of leaving the comforts of campus for community sites to connect our learning with theory-driven activities organized for young people afterschool, to unsettle our worldview and values. Today, I teach undergraduates the theory and practice of documentary research. I collaborate with colleagues and community partners to design learning activities that engage students in many kinds of border crossings. A central problem in documentary work is how is it possible to ethically represent and do justice to the lives of people whose stories are different from your own? What borders of experience, understanding, language, as well as literal borders, must be crossed? This is another space of learning where the work of Freire and Horton joins up for me. Documentary storytellers were among those missionaries, outside “do-gooders” and other troubling figures Horton describes as “all coming down to save the people of Appalachia.” When Horton says, “I resented the exploitation of people by somebody, particularly from the outside, who came in with an idea they thought was good for people, ” I am reminded of documentary filmmaker Elizabeth Barrett, and her film Stranger with a Camera. The film, about the murder of Canadian documentary filmmaker Hugh O’Connor in Letcher County, Kentucky, (and Barrett’s larger body of work with Appalshop), grows out of the resentment she felt as a young girl, towards storytellers who used cameras like weapons, shooting images that contributed to a national imaginary of Appalachia as a deeply othered place. There is another conversation I’m reading alongside the dialogue between Horton and Freire. It is bell hooks’ playful conversation between herself as Gloria Watkins and her writing voice, bell hooks, in chapter 4 of Teaching to Transgress. She is writing about her friendship with Freire and how deeply his work is felt through her own. The last time I looked this closely at my experiences in teaching and learning in Brazil was also a provocation from Bryan Alexander. It was in a multimodal story workshop at nearby Lafayette College, somewhere around 2003 or 2004. If I can locate that multimodal text, I will share it here. But I am appreciative of the invitation to read with you, to reread, with less certainty, more openness, more dialogically, and within a community of border crossers, who are doing so much to try to redefine relationships of teaching and learning and technology. –Margaret Heffernan, “Why It’s Time to Forget thePecking Order at Work,” TEDWomen 2015. How many of us have, in our daily working lives, the time we desire to develop and grow trusting relationships with our colleagues? How many of us work in organizations that are structured to prioritize meaningful connections to our colleagues? Meetings, so often focused on the urgent needs of the moment, rarely provide adequate time for allowing new ideas to surface, let alone the creative space that nurtures insights, inspiration, and deep listening. And as much as we may endeavor to construct that space on campus, sometimes getting off campus, out of the familiar work environment and routines, is required to be able to see and listen to new possibilities, new ways of imagining our work together, ways of being more less busy and more creative together. In 2016, the Solution Design Summit at OLC Innovate provided my colleagues and I on the Digital Learning Team one such space of possibility. For us, SDS was a small haven for informal, unstructured, and sometimes messy conversation within the much larger OLC Innovate conference. Laura Pasquini and Mike Goudzwaard were tirelessly patient co-chairs and shaped the space and experience for us to think creatively and even courageously about the challenges we hoped to address at our institutions. And they surrounded teams with a multidisciplinary gathering of talented and generous leaders in the field ready to push our thinking further. I’m writing this blog post to encourage readers to consider applying to SDS–here is this year’s call for proposals (deadline for submissions: November 2!). I hope that by sharing a little bit about our experience and its value to our work, readers will have another perspective on what to expect and look forward to at SDS 2017. Time and space to connect is what SDS does best. 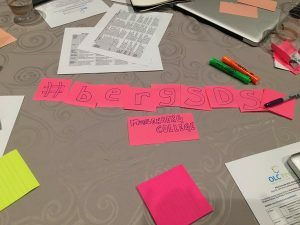 As someone who led a team to SDS in 2016, and is now part of the SDS 2017 organizing team, I have experienced from both perspectives–participant and organizer–the summit’s intentional focus on supporting groups with both time and space for conversations that matter. SDS is organized to provide teams dedicated time to create, ideate, and hone their project proposals. It is also designed to connect teams with a wide network of helpful, experienced, and brilliant educational leaders. Patrice Torcivia (SDS 2017 chair), Adam Croom, Julie Larsen, and Kyle Johnson are a few of the many people who offered substantive feedback that changed our project for the better. The heart of that proposal is the, “creation of an innovative peer education model that empowers students to develop the relationships, skills, and competencies they need to excel as leaders in digital learning contexts”. A major part of this work, clearly, concerns our plans forstudent uses and student peer support of Domain of One’s Own. Just prior to the start of this academic year, we launched a new pre-orientation program centered on digital learning and digital literacies. For a few days prior to the start of the semester, we hosted 9 incoming students and 3 student leaders. We worked together on digital mapping, digital archiving, and digital storytelling projects (and had a bunch of silly fun, too). We also handed out our very first bergbuilds.domains accounts to students. In fact, our tagline for this entire pre-orientation experience was, “A Dorm & A Domain” — emphasizing that a Muhlenberg experience is as much about staking out an online presence as it is setting up a dorm room or learning your way around campus. I’m also thrilled that all of our student leaders and many of our pre-orientation attendees have agreed to be among our very first Digital Learning Assistants. Tim traces more succinctly than I can how far we’ve come with this work since arriving in New Orleans last spring: we developed and implemented the digital learning pre-orientation and one giant measure of its success is the fact that more than half of the pre-o participants have signed up as Digital Learning Assistants. What this tells us is that students the 5-day pre-orientation provided experiences that are helping to empower students as digital learners. Digital Learning Team members designed a schedule that included: interactive digital mapping activities to learn the campus, Instagram scavenger hunts to locate less visible gems on campus, digging into the library’s special collections and digital archives, and creating digital resident/visitor mind maps. Playing ultimate frisbee at night on the college green with LED light up discs and designing and programming digital light displays and play lists for all the other pre-o groups on campus ensured that an element of play and discovery animated the program. But none of this was anywhere near fully articulated when the Digital Learning Team first arrived in New Orleans. We had some broad ideas and visions, but it wasn’t until the first SDS session that we were really able to spend concentrated time to imagine what it would all actually look like. 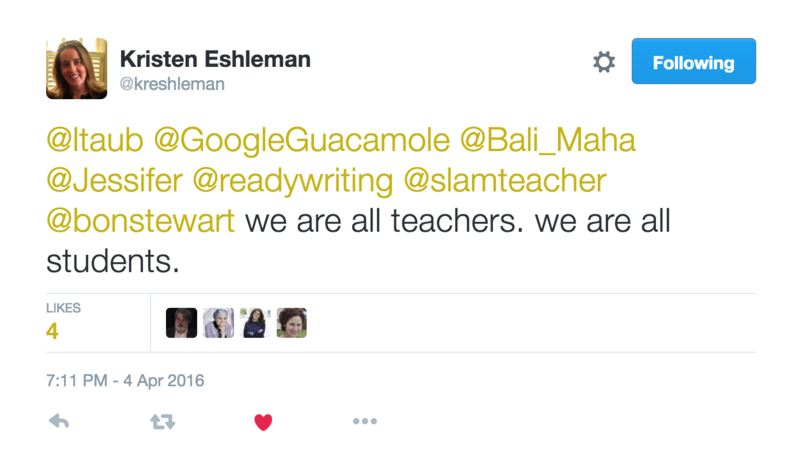 I began this post with a quote from Margaret Heffernan’s 2015 TEDWomen talk. In this talk, she takes on “the superchicken model,” where value in organizations is attributed to “star” employees who outperform others (usually at the expense of others). I overheard some jokes about “shark tank” at SDS, but SDS really creates an entirely different model. The SDS model recognizes that all innovation, all design thinking, is social. The SDS experience designed to encourage social connectedness, and the greatest benefit of SDS was the time it afforded our team to work together, uninterrupted, over the space of a few days. Our team’s thinking was transformed, strengthened, and fueled through the many generous contributions and productive critiques we received from the engaged community of experts at SDS. 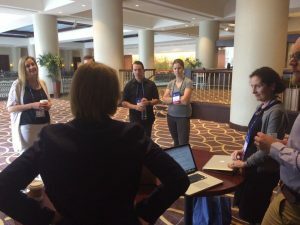 This value on generosity and collaboration infused the SDS formal sessions, but also spilled out into the hallways and elevators and corners for coffee breaks throughout the conference. Literally. Here’s Jill Leafsteadt and colleagues from CSU Channel Islands who generously agreed to observe a final run through before our presentation. Their willingness to spend 10 minutes and then share their sensitive feedback mattered a great deal to us as we prepared to go present our ideas to the SDS reviewers. SDS privileges collaboration and social support over competition. Even while SDS does select an overall “winning team,” the primary emphasis is on providing each participating team with the opportunity for rich dialogue and collaboration. The purpose is to create conditions for teams to think together creatively and courageously about the challenges they are working on, in a challenging but enormously helpful context. Heffernan’s research on work led her to the Royal Academy of Dramatic Art in London. The observations and interviews she conducted there surprised her. “[W]hen I talked to producers of hit albums, they said, ‘Oh sure, we have lots of superstars in music. It’s just, they don’t last very long. It’s the outstanding collaborators who enjoy the long careers, because bringing out the best in others is how they found the best in themselves. '” This is the sentiment that defined the environment of SDS. We had carefully honed our pitch to exactly 10 minutes, so it was a risky few seconds at the outset when I went off-script added this spontaneously to our introductions and thanks: “We should all be going back to our campuses and doing what we can to create this kind of space for our colleagues.” The outstanding collaborators at SDS helped bring out the best in each team. This was learning by doing, undoing, and redoing. And each team left SDS with an improved design to take back to their campuses. In sharing these experiences from SDS I hope to encourage readers to consider submitting a proposal (by November 2!). It’s hard to capture just how much the time with my team and the helpfulness of generous SDS collaborators has catalyzed our digital learning work at Muhlenberg. In a blog post reflecting on her recent visit to campus, Lauren Brumfeld from Reclaim Hosting notes the “togetherness” she observed among the Digital Learning Assistants. I believe that togetherness, the value of social connection, is the key to our winning SDS design project. On October 13 and 14, the Digital Learning Team at Muhlenberg College had the pleasure of hosting our friends from Reclaim Hosting, Jim Groom and Lauren Brumfeld. I’m not exaggerating when I say the days were packed and both Lauren and Jim were generous in their authentic engagement with the various staff, faculty, and student groups they met throughout the visit. The Digital Learning Team spent a long morning with Jim and Lauren, in critical discussions about how we are launching bergbuilds, our Domain of One’s Own initiative, and how to make it sustainable. It was heartening to hear their sense that the intentionality framing our early efforts has been critical to successful Domains projects on other campuses. Indeed, from the earliest moments of exploring the possibility of Domains at Muhlenberg, conversations with folks leading Domain of One’s Own initiatives at other campuses were vital to shaping our understanding, goals, and approach. This includes Kristen Eshelman at Davidson College, Andrea Rehn and Whittier College, Jill Leafstedt at CSU Channel Islands, and more recently, Martha Burtis at University of Mary Washington, Adam Croom at Oklahoma University. It also includes Andrew Rikard at Davidson, who woke up early one summer morning to share with our Digital Learning pre-O students his perspective on what it means for him to connect his learning to his own domain. Each of them has been generous in sharing their experiences getting started with Domain of One’s Own and have taught me a great deal about the kind of support and strategic thinking that is useful to iterate and sustain a local Domains project. And I think they all said, if you can do it, bring Jim Groom to campus. Having Jim and Lauren on campus for two days was an opportunity to intensely explore with them the kind of local Domains scene we hope to cultivate in our community. They paid close attention in each conversation and it was clear that they were listening deeply for the themes, values, meanings that were surfacing across many different gatherings over the two days–with the Digital Learning Team, the participants of a Domains Faculty Learning Community, the student Digital Learning Assistants, and with students in the first year seminar, “Who Controls Your Digital World?” taught by Tina Hertel, director of Trexler Library at Muhlenberg. During his workshop with the Faculty Learning Community, Jim very seamlessly worked with Digital Learning Team folks as if they were longtime colleagues–and in doing so really meaningfully called attention to the expertise on campus, especially with instructional technologists Jordan Noyes and Tim Clarke, and Jenna Azar, instructional designer. Long after Jim and Lauren’s visit ends, these are the three who will hold much of the responsibility for cultivating and supporting Domains at Muhlenberg. Digital literacies and identities are at the heart of these conversations, and so it was really intentional that Tim Clarke (Instructional Technologist) and Jenna Azar (Instructional Designer) chose the library for the site of Jim’s talk. This is a perfect place to emphasize how central librarians are to our Domains project and to digital learning in general at Muhlenberg. In the moment that Jim took the mic, it seemed as if he might bring the library roof down. Everyone loved it. 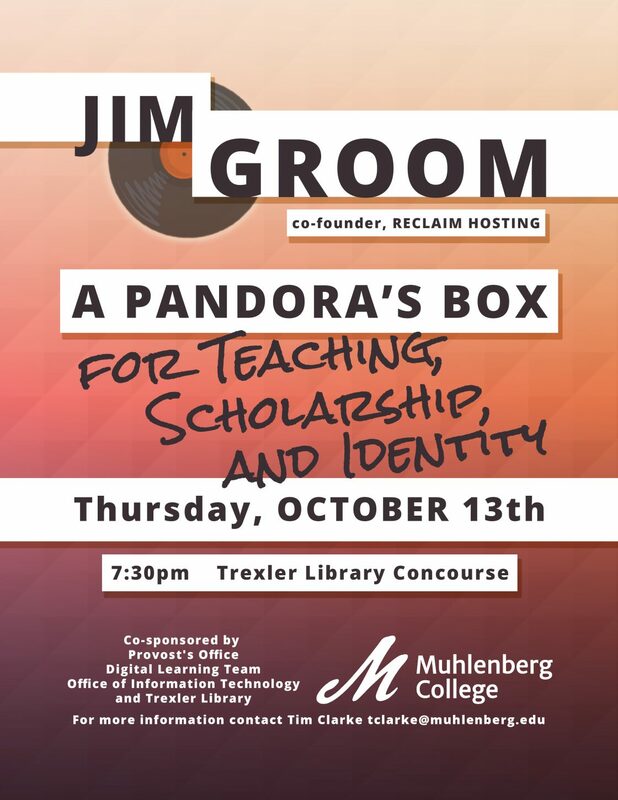 Sean Miller, manager of Media Services, helped transform the library concourse into a presentation space, and also captured Jim’s talk on video. He gets credit for the howling mic gif, too. Here’s the Storified version of tweets from the students in the class, Who Controls Your Digital World? Jim and Lauren visited their class earlier during the day and then they attended Jim’s talk in the evening. One message was pretty consistent across the many conversations throughout the two days: the importance of blogging. 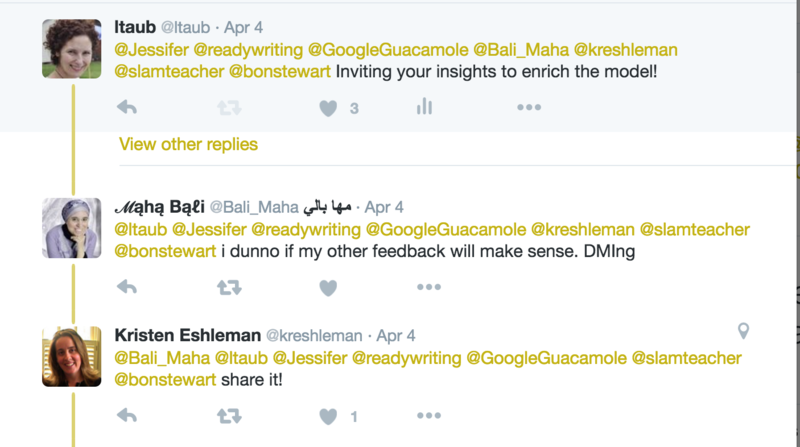 Not just the idea of blogging about our work, but the idea of blogging as our work. We were all struck by how often Jim emphasized how critical it is for us to model for students the kinds of practices we aim to encourage and grow among them, including blogging, working openly, in public. Jim and Lauren made the strongest case for making blogging part of our regular work (“if you’re not blogging, you’re not working!”) and I’m certain that this is just the first of several posts to come reflecting on the ways our work has been enriched and catapulted by our visit from Jim and Lauren. I was inspired by the pedagogy of ds106 (#4life) in which the instructors hold themselves responsible for completing and publishing assignments alongside the students. 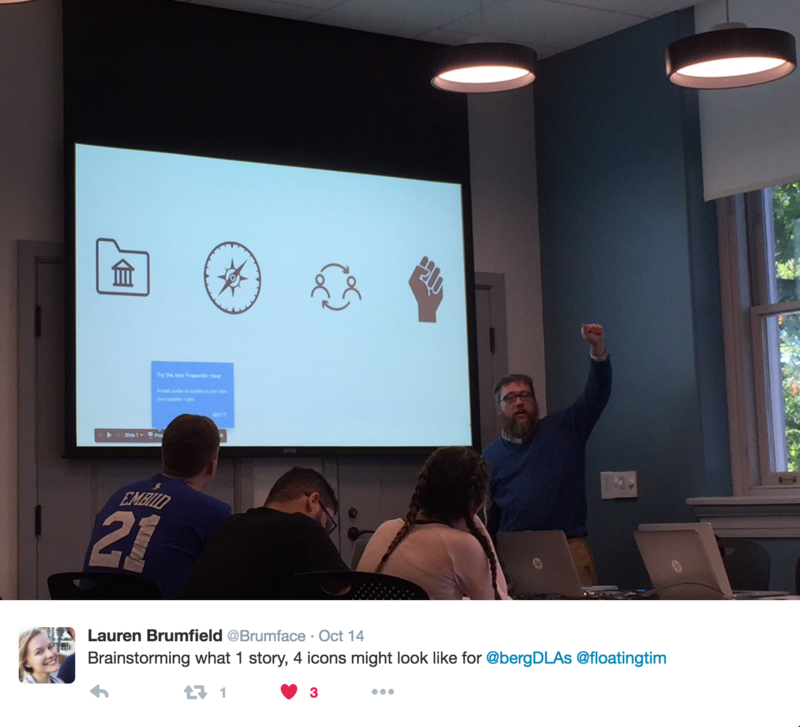 It was an activity from the ds106 assignment bank that inspired critical engagement during a session with the first ever cohort of Digital Learning Assistants. Here’s where Lauren’s presence was key–she was able to share with the students her perspectives on Domains as a recent grad, and how she made the most of her experiences in the Digital Knowledge Center at the Un iversity of Mary Washington. Thinking with Lauren and Jim about how the DLA program can help cultivate a deeply student-centered mission for Domains at Muhlenberg generated some of the most exciting and inspiring ideas for the work ahead of us this semester and throughout the year. A space (physical and digital) for them is in the works, but in the meantime interested folks can follow the DLAs here on Twitter. 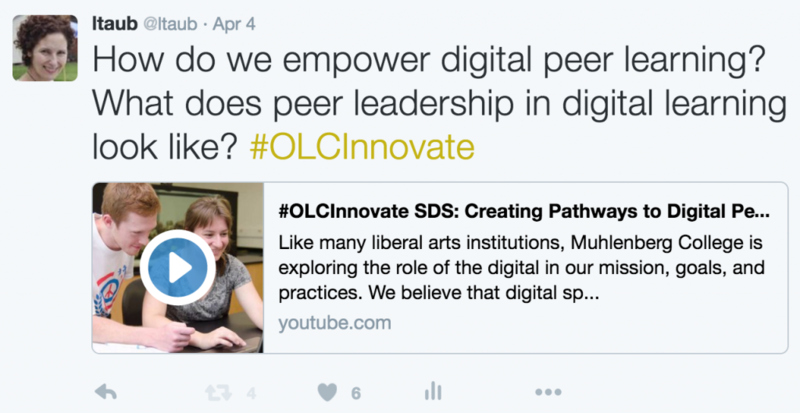 Muhlenberg College’s Digital Learning Team is participating in the OLC Innovate Solution Design Summit with a proposal to create a digital peer learning program to support and grow digital learning in the liberal arts. We were drawn to the opportunity in part because of the space created for feedback on proposals from experts, peers, and the OLC community. When our two minute “solution pitch video” appeared on YouTube with eight other innovative project videos we were excited for the feedback to begin. SDS co-chair Laura Pasquini (@laurapasquini) encouraged teams to share links to the videos and the SDS sandbox in Canvas for public feedback, so I tweeted a link to the video, which was retweeted by Muhlenberg. YouTube stats indicate the video has 114 views, 18 shares, and 2 likes. This makes us happy–the wickedly talented folks who shot and edited it took great care to make a video with a high production quality in a short timeframe. But there are no comments posted yet. The SDS team also created a sandbox in Canvas for OLC Innovate participants to share and receive feedback from the community. So far, it’s threaded with thoughtful suggestions from SDS project reviewers. Anyone can create a Canvas account and login to access the discussion space, but it seems designed primarily for those already participating in SDS or OLC Innovate. I hope this space takes off during the conference next week as a way to connect and reflect. We’re anticipating the intense Solution Design Summit on Wednesday, 4/20, and the chance to work with SDS leaders and advisors on our project. But in the meantime, how to access and invite the feedback and perspectives in our network to help push our thinking around the peer mentoring model we seek to design and implement? The last time my colleagues and I participated in an open digital learning competition was MacArthur’s digital badge competition in 2013. A brief period for public commenting generated several screens of comments for us to consider in the weeks leading up to our formal on-site pitch. That broad community feedback and generous engagement empowered our proposal and carried us into the final stage of the selection process feeling positive about the ways in which the voices of youth, their parents, and our program supporters were present in our final “pitch” to the judges. And when our proposal wasn’t funded, those voices were comforting reminders of the value and meaning of our work and helped peel our deflated selves up off the hotel lounge couch where we wept (just a little) with disappointment. Many emojis followed in my reply back to Adam, who in this text beautifully unmasks common assumptions about who is an expert, who is a leader, and who is a learner. Naming storytelling as a method for diminishing hierarchy in learning, Adam recognizes that in context of peer learning, identities are fluid and learning is a coproduction. Against the discourses of “personalized” and “individualized” learning prevalent in much online learning, we want to begin from a pedagogical space that invites story, vulnerability, and openness to new ways of being in relationship to learning, to the digital, and to each other. In our proposal to SDS, we’re envisioning a 5-day pre-orientation as a pedagogical space for incoming freshmen to join with peer leaders, faculty, and staff to immerse themselves in the digital liberal arts. Building a foundation in critical digital literacies with activities including digital mapping, Domain of One’s Own, scavenger hunts in the digital archives, and digital storytelling, we imagine these students will have opportunities to become peer leaders and help grow a digital learning community on our small liberal arts campus. I then took what felt at the time like a radical leap and directly invited engagement from some of the people in the #digped community from whom I have learned a great deal on Twitter. Which was, of course, to welcome vulnerability and entrust the work to review by peer experts I have never met in person and admire deeply. The conversation that emerged during the next 24 hours was more than I ever expected and has occupied a big part of my thinking since then. I’m distilling it here to share with my team as well as to make visible my appreciation for those who responded with thoughtful critique and suggestions. The entire conversation, of course, can be traced on Twitter. ℳąhą Bąℓi (@Bali_Maha) was first to respond, via direct message, with two critical observations on the video: she wondered about the utopian, market-y tone carried throughout the video at odds with a more nuanced and critical language she expects in digital literacy discourse. I attribute some of this to the genre of the 2-minute pitch. The language of the pitch doesn’t come easily to me–it’s uncomfortably close to “sales pitch” for me and invokes the rapid-fire pitch sessions so linked with venture capitalism. And I know I am not alone in puzzling over the tensions inherent in navigating the commodification of edtech in digital learning spaces. More on the meanings of “pitch” below. Maha also zeroed in on a disconnect between the visual and voiced over representations of our SDS project team. Here again, a call for more nuance: what did we mean by describing the team as “diverse?” Bonnie Stewart (@bonstewart) and Kristen Eshelman (@kreshelman) noted the same tension and suggested “cross-disciplinary” or “transdisciplinary” more accurately communicated what we were trying to convey: this work deeply connects staff from IT, the library, faculty, administrators, and students. Building community and connection across these usual silos is itself something of a critical act in that it works against entrenched institutional structures and forces. The experience of making the video together strengthened those connections. Speaking of silos, Maha had the excellent suggestion that as we focus on students, we not miss opportunities to include spaces and moments in the 5-day pre-orientation that bring students and faculty together in collaborative digital learning practices. The GIS mapping across campus and in our neighborhood, digital archives scavenger hunts, introduction to Domain of One’s Own, and digital storytelling all afford moments of meaningful collaboration among all pre-orientation participants. Yes! 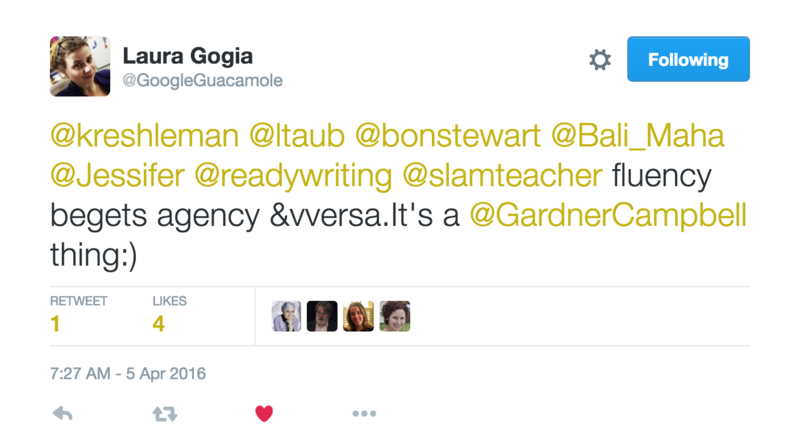 was the answer from me and Kristen, who then got us thinking about the relationship between agency + fluency. That’s the winning pitch right there: “It’s a Gardner Campbell thing.” Laura’s comment brings us full circle, arriving back to Maha’s reminder of critical pedagogy, a focus on the interwoven acts of reading the world and reading the word.